Gozer Games will be back at Anime Central this coming weekend. We will be at booth 429 in the dealer’s room, so come check us out! In addition, we’re doing something unique this year. 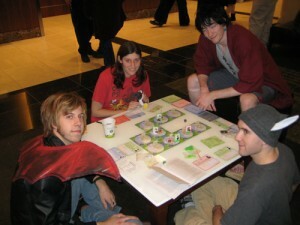 ACen is our “home base” anime convention, so we want to do something special for them for 2010. We will be running a Life Size/Live Action/Cosplay version of Collateral Damage: The Anime Board Game at Anime Central this year. Like Cosplay Chess, you get to play the various character pieces on the board, with a large board laid out in the middle of the room. Or, you can watch others fall in love and fight each other. We will be capturing the event, so we’ll be sure to post pictures when it’s done. We should have a couple of other surprises in store as well.